﻿ UPS – Uninterruptible power supply – KONČAR Elektronika i informatika d.d. The simplest and most effective way of protecting from disturbances in the electrical power supply is the installation of the UPS. 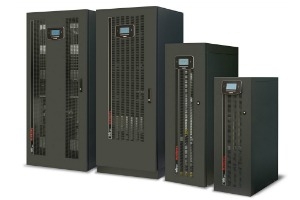 The UPS has the role of interface between the mains and the load and ensures steady operation and the quality of the power supply of the load, regardless of the mains status. In fact, these systems stabilize the voltage perfectly, eliminating any disturbance. In case of mains failure, they provide energy from batteries as long as necessary for safety of people and systems.